Definition at line 28 of file CGraphNode.h. Definition at line 31 of file CGraphNode.cpp. 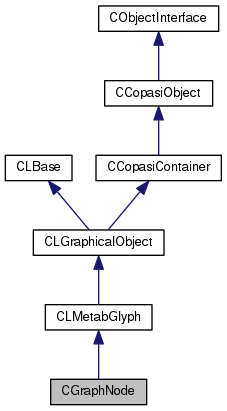 Definition at line 41 of file CGraphNode.cpp. Definition at line 51 of file CGraphNode.cpp. Definition at line 63 of file CGraphNode.h. Definition at line 56 of file CGraphNode.h. Definition at line 61 of file CGraphNode.h. Definition at line 52 of file CGraphNode.h. Definition at line 82 of file CGraphNode.h. References CLGraphicalObject::mBBox, msize, and CLBoundingBox::scale(). Definition at line 88 of file CGraphNode.h. Definition at line 79 of file CGraphNode.cpp. Definition at line 57 of file CGraphNode.h. Definition at line 61 of file CGraphNode.cpp. Definition at line 35 of file CGraphNode.h. Referenced by getLabelText(), operator<<(), and setLabelText(). Definition at line 33 of file CGraphNode.h. Referenced by getObjectKey(), operator<<(), and setObjectKey(). Definition at line 32 of file CGraphNode.h. Referenced by getOrigNodeKey(), and operator<<(). Definition at line 31 of file CGraphNode.h. Referenced by getSize(), operator<<(), scale(), and setSize().